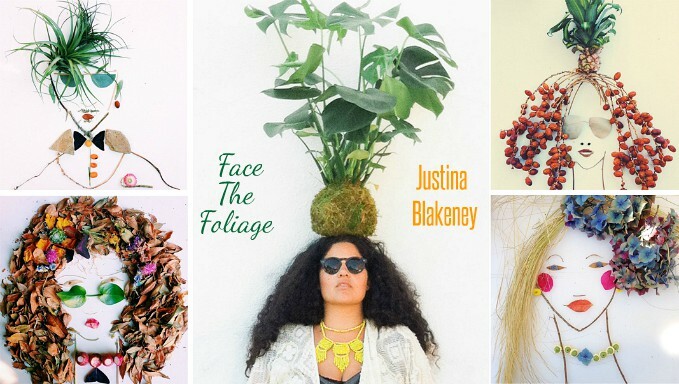 Talent Feature: Justina Blakeney - Creator of "Face The Foliage"
I've got to say, ever since joining Instagram almost three years ago, I have discovered so many talented photographers, artists, and overall creative people. Personally, I don't post often on my own feed (maybe once or twice every two weeks), but I do enjoy looking at what others post daily. 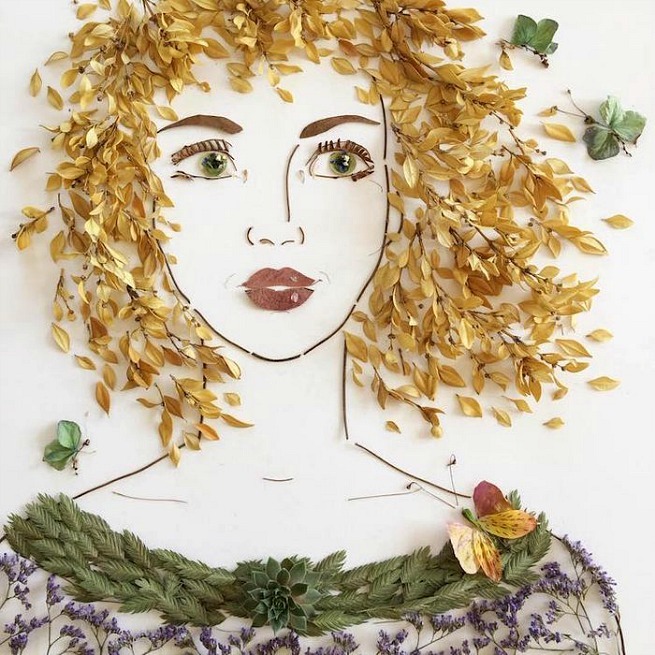 A few months ago, I discovered the Instagram feed, Face the Foliage by designer Justina Blakeney, where she shares portraits made out of leaves and flowers. I also discovered her colorful and bohemian lifestyle blog entitled, Jungalow, where she shares home decor ideas, recipes, and many other topics. 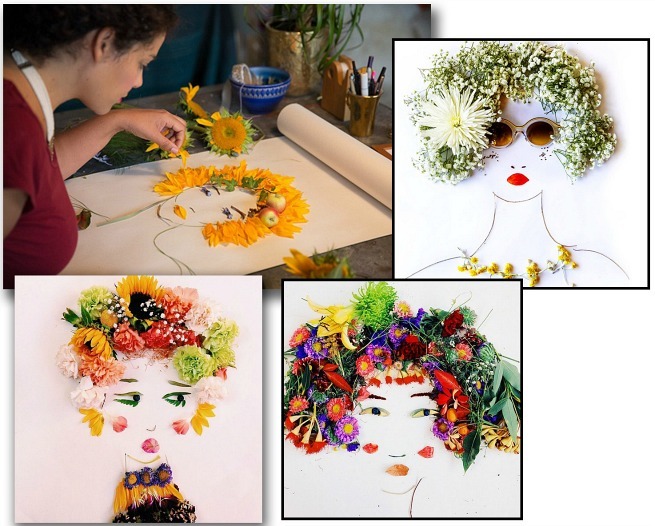 I enjoy featuring the talents of others on my blog, so I am delighted to share several foliage portraits created by Justina. I had a difficult time deciding on which ones to highlight because there were so many outstanding ones to choose from. Also, because it's April, I thought these portraits would tie in nicely with Spring. Have a deeeelightful week everyone! Those are really neat, Ron. I especially love the bird (robin?) because the colors are so amazing. I'm fascinated by people who come up with ideas like this AND are so talented in making it work. Hope you have a creative week, my friend! These are beautiful, Ron -- thank you for sharing them with us! 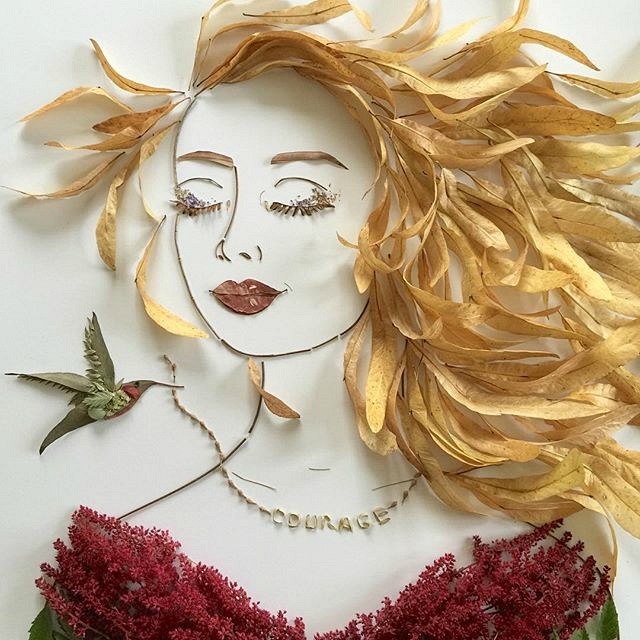 I particularly love the one with the wind-blown blonde "hair" and the hummingbird stringing the "courage" necklace. It must take her a long time to get these portraits just right, but the results are amazing! I don't follow Instagram much, but perhaps I should remedy that. 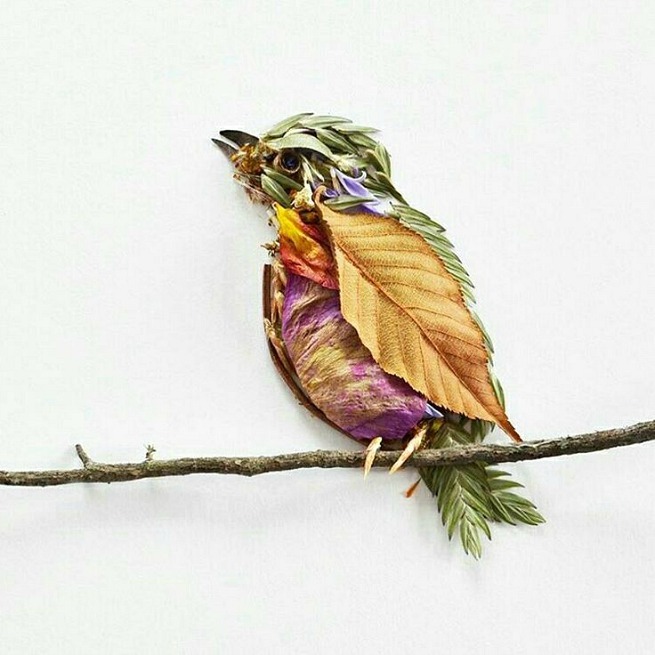 We can get all sorts of inspiration from other creative souls, can't we? Happy Monday to you -- enjoy the week ahead! Wow! Those are very unique and clever. Artistic people amaze me; I couldn't come up with anything half as good even using a regular pencil and paper. Great find, Ron. Thanks for sharing - I'm going to have to check out her stuff on Instagram! You may not post often there, but you've got your own niche and are quite the talented photographer yourself. More, please! Ron, I can see why you chose to highlight Justina's talent because these foliage portraits are so unique! And the colors are stunning, each one more beautiful than the next. 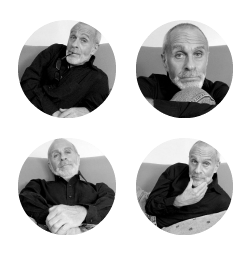 I especially love the shoe and the final one. You're right, the attention to detail is amazing. Thank you for sharing, Ron. I will definitely check out her feed. When I discovered Justina's feed, I was immediately drawn in. And it was through Instagram, I found her blog, which by the way, is soooooooo delightful! I love her sense of bohemian style! I too love all the beautiful colors, which is why I thought highlighting her portraits would be perfect for SPRING! Thanks so much for stopping by, my friend. Have a wonderful week!!! I'll tell ya, I was hesitant to join Instagram because I honestly thought I wouldn't like it. At first, I didn't understand what the point was. However, over these past three years, I've discovered so many talented artists, photographers, and just all-around creative people. I've also discovered many NYC photographers who I hope to meet when I move there in Sept. When I discovered Justina's Instragram feed, I was immediately interested in following her. And through her feed, I discovered her blog. Very cool lady! Thanks so much for stopping by, my friend. And thanks for your kind, encouraging words. It's been such a joy following you on Instagram. Your photography is AWE-SOME!!!!!!!! Yes, isn't the robin fantastic? On her feed she has many other animals as well. She created quite a few dogs and cats. "I'm fascinated by people who come up with ideas like this AND are so talented in making it work." Me too, which is why I felt so drawn to share her unique talent. I can't imagine the time and effort that goes into creating these. 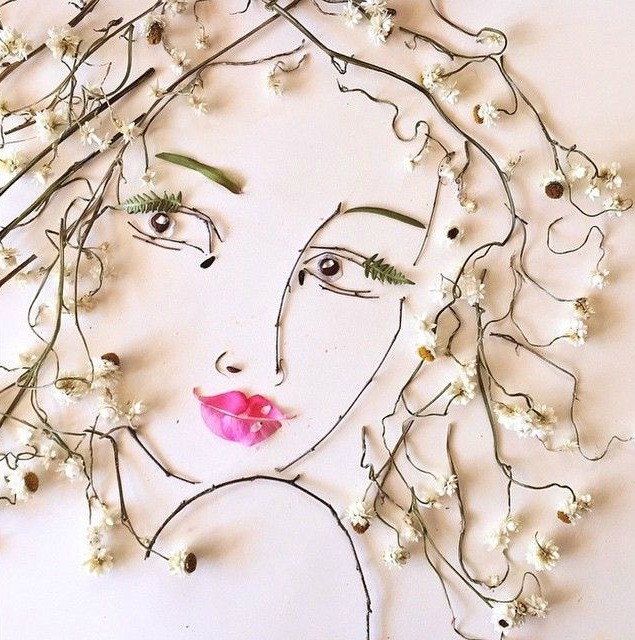 And I also wondered what she does with all of her portraits after she makes them because she has hundreds and hundreds. Ron, before I left my comment I went over to Instagram to check out more of her portraits, OH MY GOD...they are amazing! 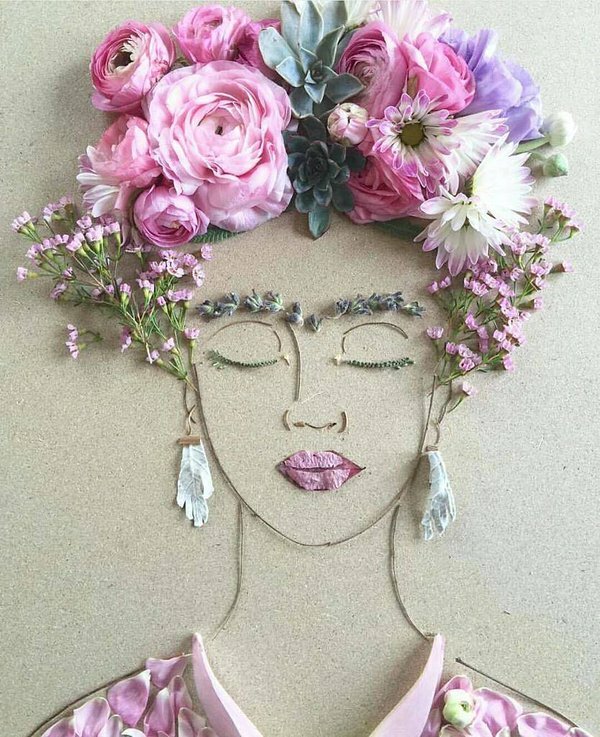 I noticed that she does a lot of portraits of Frida Kahlo and they're glorious! I also checked out her blog and loved it. I bookmarked it so that I can go back and peruse more when I get home from work tonight. And I can tell, just at first glance that I'm going to enjoy reading her blog. I noticed that she also published several books. I love her style! I think my two favorites from your selection are the first one and the third. But I also love the little birdie! Isn't she so talented? And clever? I found her Instagram feed by chance and was immediately drawn to it. Her blog is delightful as well! "Third from the end plus the end one are amazing. 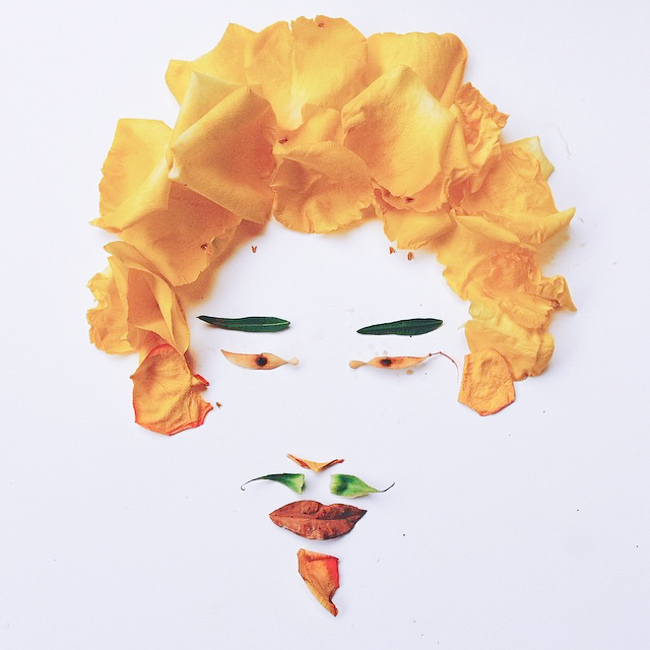 It is astonishing how just a few petals can actually create a face." I know, I thought the same thing. And I also love how she creates both female and male, and that you can see the different. I had such a difficult time choosing just these because they are ALL faaaaaaaaabulous! Aren't they beautiful? I was so impressed with her talent that I had to shared it. Yes, I love the ones you chose as well. I had the hardest time choosing these because they're all special in their own way.
" It must take her a long time to get these portraits just right, but the results are amazing!" I thought the same thing. I also wondered what she does with all these portraits after she completes them? I mean she must have HUNDREDS. I read a blog article online about her that said various companies hire her to create their marketing images. 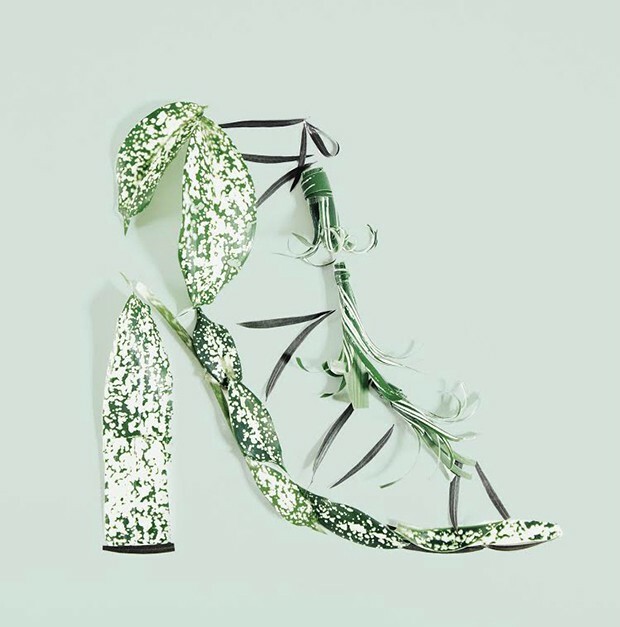 Like the one of the shoe, she created that for a shoe company to run as an ad. I've been on Instagram for three years and have found that I really like it because I've discovered so many talented photographers, artists, and creative people. Thanks so much for stopping by, my friend. Have a great week ahead too! Yes...yes...yes! She does a lot of Freda Kahol portraits, you're right. I noticed that immediately because I am a HUGE fan of not only Fred Kahlo, but also the movie that was made about her life (with Salma Hayek). Did you see it? I love her blog too. I love all the topics she shares. And I also love the design of her blog. Yest, she has published several books. Isn't the birdie cute? What a talented lady, hu? Yes, I have seen the move about Frida Kahlo, Frida. It was so good! I have the movie on Blu-ray. Me too! Except I have it on DVD. Salma Hayek is so good as Frida! Isn't it amazing, Fiona? Such a talented lady she is! The second I spotted her portraits, I knew I wanted to share them here on my blog. I like the one with the woman and the hummingbird. My favorite, though, is the bird one. Very interesting work. 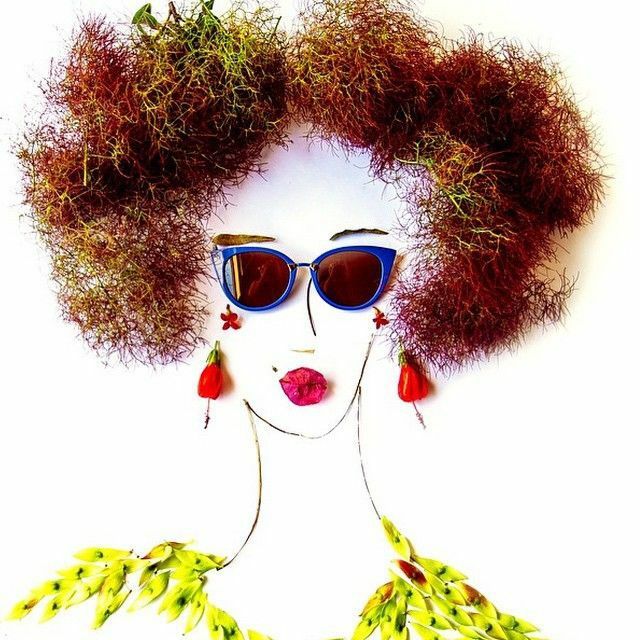 I have an artist friend who does portraits with fruits and vegetables. I always wonder what makes people who do things like this suddenly think, "I know! 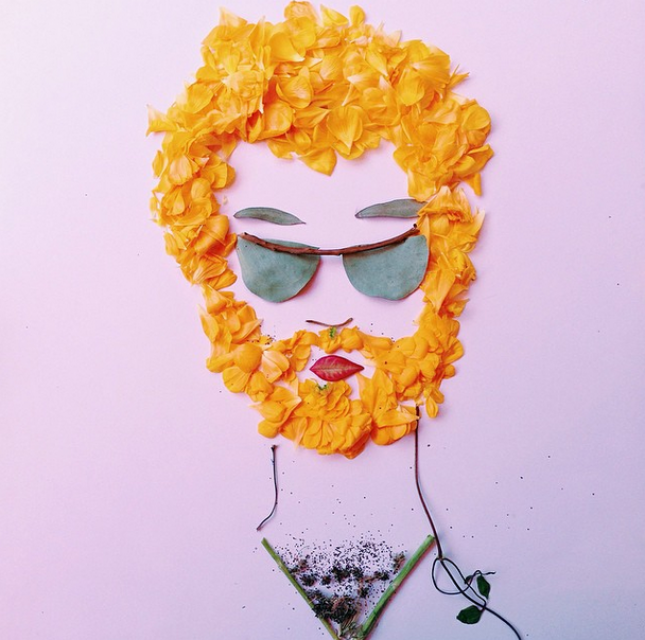 I'll make a portrait using bits of plants!" Yes, isn't that one faaaaaaaaaaaaabulous? One of my faves as well! "I always wonder what makes people who do things like this suddenly think, "I know! 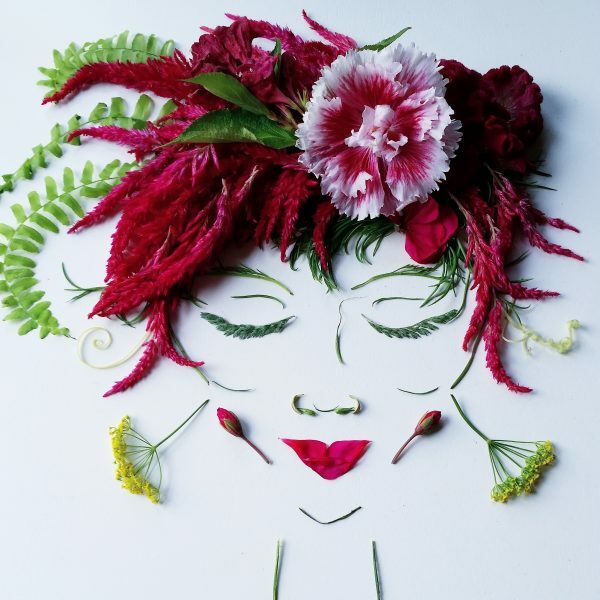 I'll make a portrait using bits of plants!"" Me too! I'm fascinated by what inspires people to create something so original. That's why I'm especially attracted to creative people! Ron, what a talented young lady! These are so beautiful! I immediately could identify the one of Frida Kahlo. LOVE the brows LOL! The one below looks like a flapper from the 1920's. But I think my favorite is the first one with the humming bird draping the courage necklace. How creative! Thanks so much for sharing Justina's special talent. I'll be checking out her blog later tonight. Can't you believe the weather we're having? Hot and humid two days ago, now it's freezing and raining. I am so looking forward for a REAL spring! Don't you love the one of Frida Kahlo? 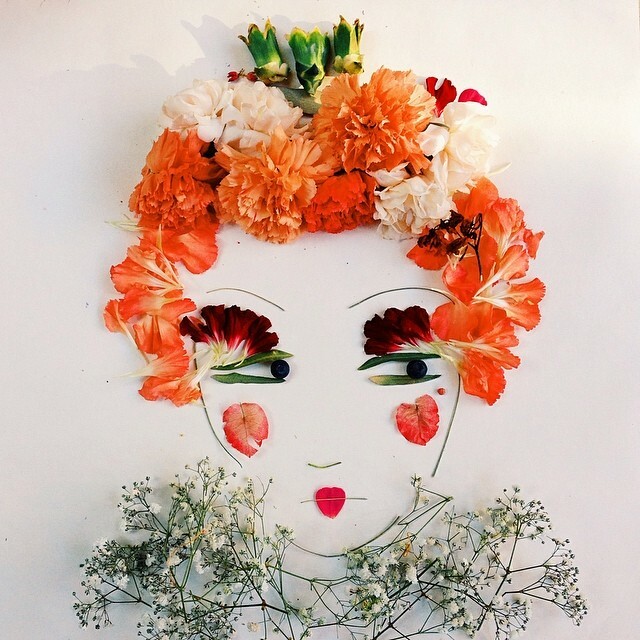 And you can tell that Justina is a big admirer of Frida because she creates a lot of Frida portraits. Aren't the eyebrows perfect? You're right the one below does look very 1920's flapper!!! Especially the lips. Her blog is full of so many wonderfully diverse topics, so I think you'll enjoy it. OMG...yes...the weather has been so bipolar. I couldn't believe how hot is got on Saturday (mid-80's), then overnight it got so cold and Wintery. I saw that it clears up over the next two days. Thanks for stopping by, neighbor. Have a wonderful week! Very unique and creative! I wish I had time to "play" like this! And, yes, the details are amazing. Thank you for sharing her special gift with us. Isn't Justina such a unique talent? The minute I spotted her portraits on Instagram, I knew I wanted to share them. Her attention to detail is AMAZING!